CanSpace Solutions Review 2019: Is CanSpace Solutions a Good Hosting? With more than ten years of experience and a wide range of reliable internet services, CanSpace Solutions has earned the trust of Canada’s largest organizations and government agencies to become their hosting consultants. Its hosting packages are rich with features and the customer support is great. Toronto-based CanSpace Solutions isn’t a new face in the web hosting market. It’s been one of Canada’s leading providers since 1998 with an array of hosting, domain registration, web/logo design, web development, and e-commerce solutions. The website is very sleek, clear, and available chiefly in English. Taking pride in its Canadian origins, CanSpace Solutions’s data centers and servers are all located in Canada. There are data centers in Toronto, Vancouver, and Montreal powered by 100% green energy, but currently all new deployments are done in its Beauharnois, Quebec location to take advantage of the green energy provided by the hydroelectric station there. CanSpace Solutions shared hosting is exclusively cPanel, the industry standard for Linux web hosting. It doesn’t support any Windows or Microsoft related databases or coding. However, you can certainly connect to it and manage it from Windows PCs. Jailshell SSH access is also allowed as needed and you can create Cron Jobs easily from cPanel. While Remote MySql connections aren’t available, CanSpace Solutions provides phpMyAdmin for database management within the control panel. All shared hosting packages come with Softaculous auto-installer, website builder, free DDoS protections as well as free Comodo and Let’s Encrypt SSL certificates. One of CanSpace Solutions’s strong points is its “no overselling” commitment. These guys are very clear and straightforward about the services they offer without making any unrealistic promises. You get what you pay for, simple. On the other hand, CanSpace Solutions is “a proud Canadian” that charges only in Canadian dollars, so non-Canadian citizens may be subjected to additional conversion fees. However, it’s still a very good value for money considering the quality of service and range of features. There are three shared hosting packages ideal for private users and small businesses, Starter, Medium, and Professional. The Starter plan is more limited in disk space, bandwidth, and other features such as number of domains, MySQL databases, email accounts, and SEO tools. On the flip side, both the Medium and Professional plans come with higher web space and several unlimited features including bandwidth, MySQL databases, domains, and email accounts. Attracta SEO tools and web application firewall are also present in both plans. Even though CanSpace Solutions doesn’t offer a free trial, there’s a 30-day money-back guarantee on all packages. A free domain registration is also included within all annual subscriptions. You can sign up using Visa or Mastercard. CanSpace Solutions once again scores high for customer support. There are several highly responsive support channels such as email, 24/7 ticket system, phone, and social media. 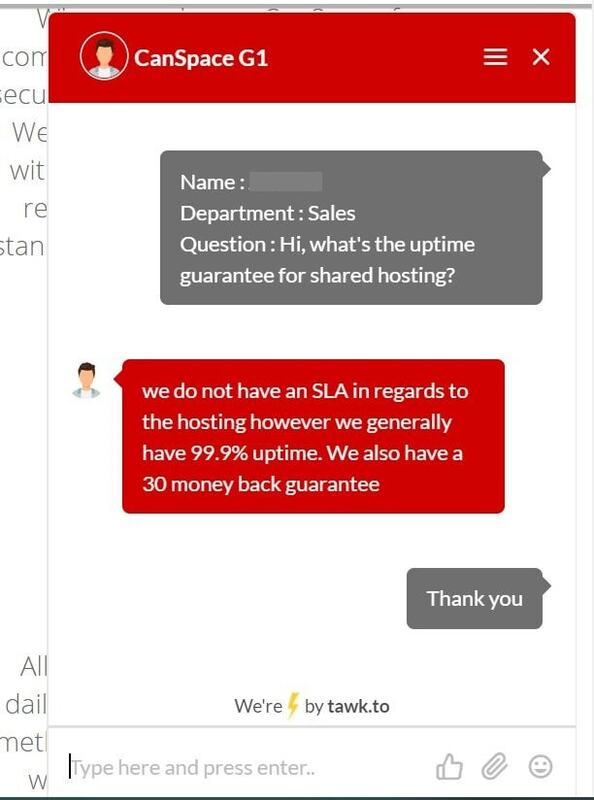 Live chat is also available, but not around the clock. I contacted both ticket support and live chat teams who were able to give me all the information I needed in a professional and friendly manner. onClick="trackClickout('event', 'clickout', 'Vendor Page - Visit User Reviews', 'CanSpace Solutions', this, true);"
CanSpace Solutions is a credible hosting provider run by a professional and business-oriented team. It’s also reasonably priced and provides great support. 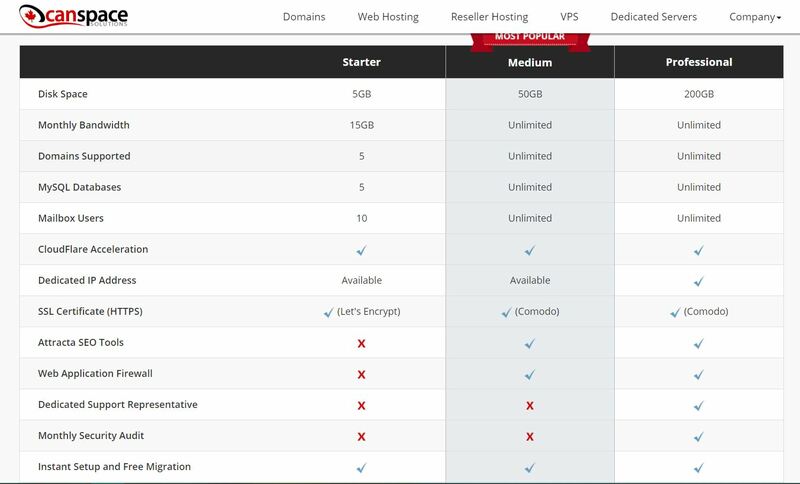 Wondering how CanSpace Solutions stacks up against other Web Hosting companies? Enter any other Web Hosting company and we will give you a side-by-side comparison.